Dr. Dimitris Kyriazis – Cardiovascular Associates, P.C. Dr. Dimitris Kyriazis, a native of Skyros, Greece, graduated from the University of Southern California and received his Doctor of Medicine degree from the University of Chicago Health Sciences – Chicago Medical School. Dr. Kyriazis completed residency training in general surgery at Baylor College of Medicine in Houston, Texas and studied thoracic and cardiovascular surgery under the direction of Dr. Michael E. DeBakey. 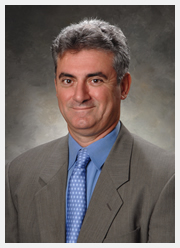 Dr. Kyriazis is a diplomate of the American Board of Surgery and the American Board of Thoracic Surgery. He is a fellow of the American College of Surgeons and American College of Chest Physicians.